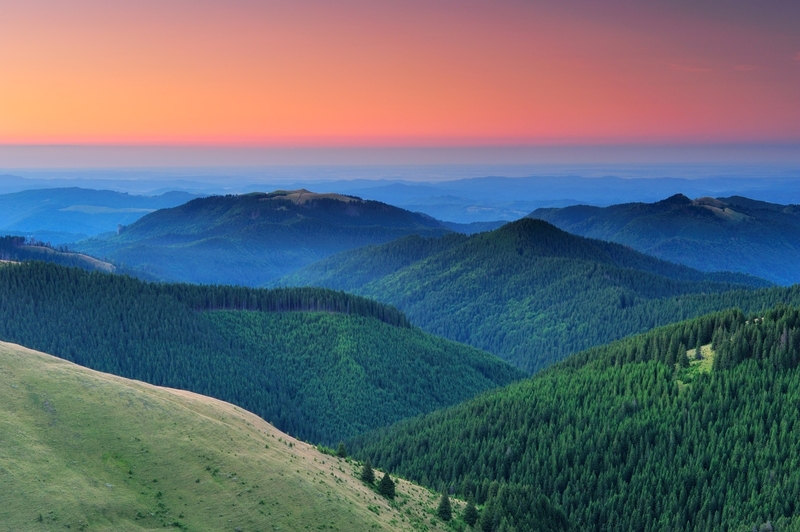 This year a new project started in the Southern Carpathians called “Wilderness Innovation Lab”, co-financed by a grant from the Swiss Contribution to the enlarged EU. 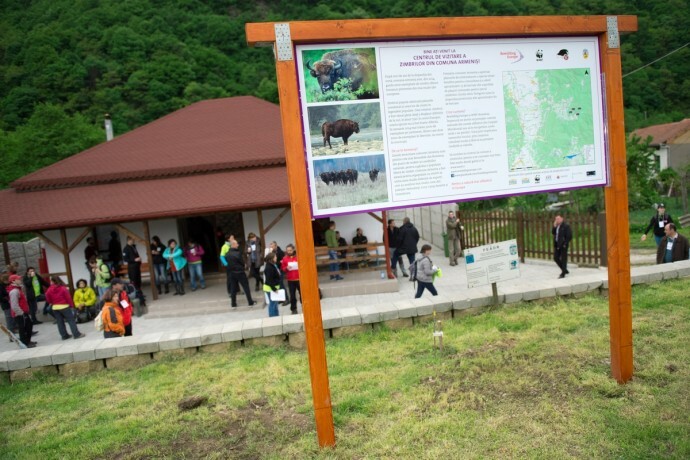 The aim of the project is to help tell the story of bison reintroductions in real time through multimedia installations in the Southern Carpathians Visitor Centre. The centre is located in Armeniş, Caras-Severin County in Romania where Rewilding Europe and WWF Romania are leading a bison reintroduction project, on a 59,000 hectare protected area. Southern Carpathians visitors centre in Armeniş, Caras-Severin County, Romania. Wilderness Innovation Lab project is led by Rewilding Europe’s partner WWF-Romania, Modulab (an interdisciplinary laboratory for art, technology and design), the local community association AMZA and Armeniș City Hall. Project activities will link together with the activities of EU funded LIFE Bison project supporting the reintroduction of the European bison into the Tarçu Mountains Natura 2000 site in the Southern Carpathians. The project aims to bring conservation research closer to the people, by using artistic innovation that mixes technology, hardware and software in an integrated and creative way. The interactive online platform will be a go to place for observing the dynamic process of the bison population’s adaptation to the ecosystem, while the three multi-sensorial installations will transform the visitor centre into an interdisciplinary space for applied ecology. Local guides training in the visitors centre in Armeniş, Southern Carpathians, Romania. The visitor centre will become a place for the local community, tourists and specialists in nature conservation and rewilding to come together, share ideas and get inspired. The installations are designed to interpret rewilding insights so that locals and tourists learn about the bison’s impact through interacting with them. Local community events, specialized workshops as well as classes for schoolchildren will put the Southern Carpathians visitors centre on everyone’s map. In early 2017 the project will bring together practitioners in electronics, architecture, design, sociology and ecology, to jointly work in two interdisciplinary hackathons – a gathering where programmers collaboratively code over a short period of time. Two hackathons will be dedicated to wildlife monitoring, measuring impact of bison reintroductions on the ecosystem and incubate out of the box ideas to take rewilding work one step further. Furthermore the project aims to create an innovative centre for applied ecology, used by students and practitioners from various fields taking part in workshops ranging from electronics to driftwood furniture where guests can be amazed by the interactive displays put together by Modulab. People from around the world will be able to observe the impact the bison are having almost in real time. The data gathered though our research programme will trigger the content on the interactive platform and on site exhibition making the research and rewilding efforts more accessible to the wider public. Tarcu mountains nature reserve, Natura 2000 area, Southern Carpathians, Romania. The interior design of the visitor’s centre will demonstrate the project goals. 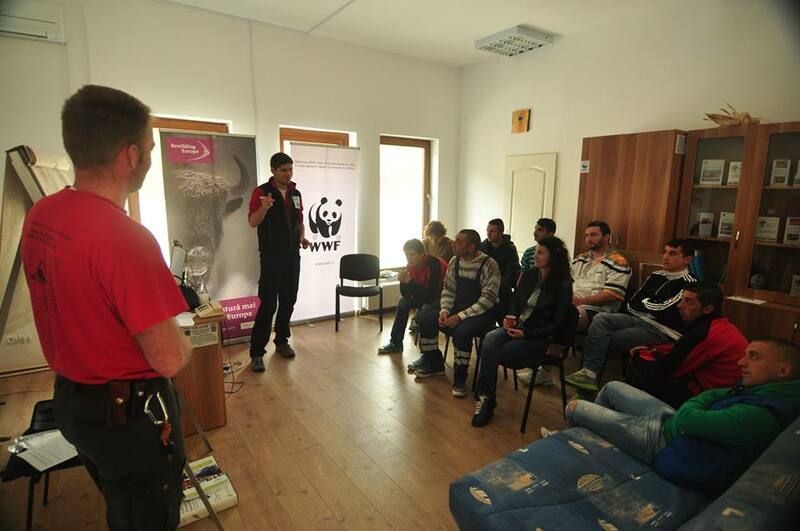 Furnishings will be made from local materials, the Rewilding Europe-WWF local team will upcycle driftwood from the local community. Ciprian Manda, a renowned interior design architect will work side by side with a family of carpenters from Armeniş and a small army of volunteers to give new life to materials that would otherwise become firewood. Green areas around the centre will give visitors the chance to relax and visit to the bison area, while indulging in locally made syrups or handpicked medicinal teas made from plants specific to the Tarcu Mountains. The outside of the visitor centre will tell the story of the bison’s comeback to the Southern Carpathians. Alexandru Ciubotariu, renowned illustrator and street artist, will paint an original interpretation of the food chain with help from local children. The design will show the role of the bison in the ecosystem and honor cultural symbols of the region. In a later project stage a research station will be established, offering accommodation and office facilities for national and international students and practitioners, making Southern Carpathians a great place for internships and place where young professionals have a chance to gain practical skills in rewilding. 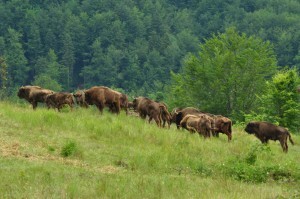 European bison in Southern Carpathians, Romania. Rewilding Europe, WWF and partners involved in the project are working towards a model for sustainable local development in Armeniș also known locally as the Bison Hillock. There the well-being of local communities can be sustained through nature-friendly enterprises connected to the largest national bison reintroduction plan in Europe, in an area where the European bison disappeared from over 200 years ago. By creating better infrastructure for rewilding, wildlife research and bringing science closer to the people the number of visitors in the area will increase, creating a direct benefit to the local community. Rewilding Europe offers the perfect opportunity for you to become an active part of the rewilding movement in Europe by supporting the actions that we are working on. If you would like to be part of returning the European bison in Europe’s ecosystems, join us now and support the return of the bison.